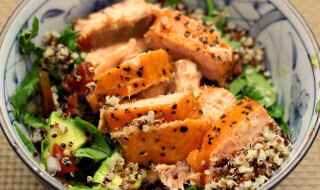 The link between omega-3 and protection against heart disease has been well documented by various researchers. However, omega-3 fatty acids, which consists of eicosapentaenoic acid and docosahexaenoic acid, have shown to be beneficial in reducing the risk of depression, inflammation related to asthma, attention deficit disorders among many. Blend all dressing ingredients together to make a thick liquid. Add little water while blending. Now wash spinach and chop it. Peel the apple and cut into small pieces. Wash the tomato, cut it into medium size chunks. Deseed the tomato. Now combine spinach, apple and tomato toss them and add dressing. Garnish the salad with cheese and ground flaxseed and serve.